The other animal of note in Wilpattu is the famed Sri Lankan Leopard. The Sri Lankan Leopard is a subspecies of the Indian Leopard and is currently the largest in Asia. These magnificent big cats can often be spotted lounging beside the villus inside the park, providing for excellent filming and photography opportunities. 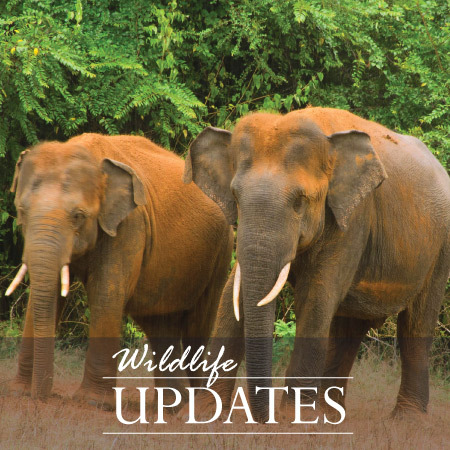 As the Wilpattu National Park is the largest National Park in Sri Lanka, there is considerably more ground to cover to get to the heart of where the animals are. Considering this, you definitely want to choose an accommodation option that is closest to the Park or ideally within the confines of the Park itself. Big Game Safari tented safari camps are set up inside the park itself. 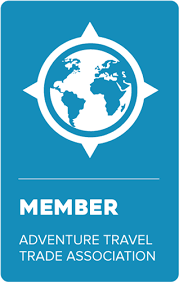 This enables you to go on walking trails and night safaris around the campsite. 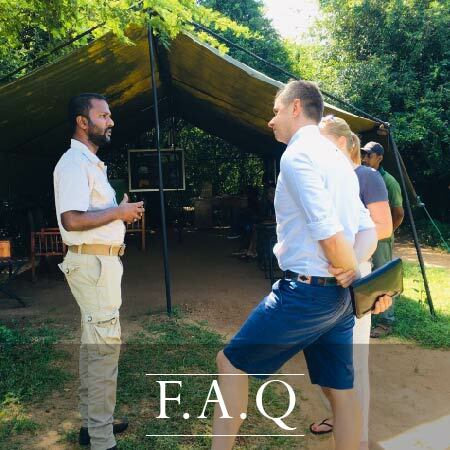 We can even arrange for tented safari camps on the borders of Wilpattu but please note that there is an additional fee and prior booking is required. For more information on Big Game Safari tented safari camps, please visit our accommodation page. However, if you would prefer to stay in a nearby hotel just let us know and we can arrange it for you. Declared a sanctuary in 1905 and upgraded to National Park status in 1938, the Wilpattu National Park is located on the west coast close to the ancient city of Anuradhapura .The jungle is dry zonal and fairly thick, intersected by flood plain lakes. A topographical feature particular to this part of the island is the abundance of villus, or natural lake-like basins which dot the landscape in the Wilpattu National Park. Except for two, all the others contain rainwater and thus are important for resident and migratory water-birds. The history of the park is also of interest with ancient ruins having been discovered here. Queen Kuweni (considered to be the mother of the Sinhala race as it is out of her marriage to the first king of Sri Lanka that its people were born) is said to have lived in the place known as Kalli Villu. Historical evidence also points to the fact that Prince Saliya son of King Dutugemunu (an ancient king of Sri Lanka from 161 to 137 BC) lived in Wilpattu over 2,000 years ago. Urns from ancient times have been excavated in Pomparippu which borders the park. Between the villages of Palangaturai and Kollankanatte are the remains of an old harbour. There are 30 recorded species of mammals in the Wilpattu National Park which include the Sri Lankan Elephant, Sri Lankan Leopard, Sri Lankan Sloth Bear, Spotted Deer, Water Buffalo, Sambar, Mongoose, Mouse and Shrew. The Wilpattu National Park is also considering extending its boundaries to include The Dutch Bay and Portugal Bay in order to protect the endangered Dugong. Wetland bird species found in the Wilpattu National Park include the Garganey, Pin tail, Whistling Teal, Spoonbill, White Ibis, Large White Egret, Cattle Egret and Purple Heron. In addition, many species of Terns, Gulls, Owls, Buzzards, Kites and Eagles are also easily spotted. The endemic Sri Lanka Junglefowl, Little Cormorant and the Painted Stork can also be seen on safari. The most common reptiles found in Wilpattu are the Monitor Lizard, Mugger Crocodile, Common Cobra, Rat Snake, Indian Python, Pond Turtle and the Soft Shelled Turtle. Most of these reside in the Park’s numerous villus. Many species of flora can be identified in the Wilpattu National Park such as Palu (Manilkara hexandra), Satin (Chloroxylon swietenia), Milla (Vitex altissima), Weera (Drypetes sepiaria), Ebony (Diospyros ebenum) and Wewarna (Alseodaphne semecarpifolia). Three distinct types of vegetation are prominent; salt grass and stunted shrub bordering the coastal area, a coastal strip of approximately three to six miles of monsoon scrub and dense monsoon forests further inland. The annual temperature in the Park is around 27°C and its annual rainfall is approximately 1,000 mm. The Wilpattu National Park is situated in the dry zone but strangely does not follow normal dry zone climate patterns. The period between September to December is known as the rainy season while inter-monsoonal rains are experienced between March and April. The period of drought in the Park extends from May to early September.